There appears to be some debate regarding just how much of a bug it is and whether it's fixable. It does seem like bad behavior to me. It was especially troubling to me because, in Chrome at least, it occurs when the code resides in scripts that are executed immediately (before the page is loaded), even when the console is open, whenever the page is refreshed. Calling console.log when the console is not yet active only results in a reference to the object being queued, not the output the console will contain. Therefore, the array (or any object), will not be evaluated until the console is ready. It really is a case of lazy evaluation. From Eric's explanation, it is due to console.log() being queued up, and it prints a later value of the array (or object). All of these methods are obviously very slow, so even more so than with normal console.logs, you have to strip them off after you're done debugging. This is already answered, but I'll drop my answer anyway. I implemented a simple console wrapper which doesn't suffer from this issue. Requires jQuery. It implements only log, warn and error methods, you will have to add some more in order for it to be interchangeable with a regular console. Looks like Chrome is replacing in its "pre compile" phase any instance of "s" with pointer to the actual array. The way console.log works isn't standardised, so in rare cases some browsers will delay console.log for performance reasons. However, it is odd that it happens for something as simple as this. how to iterate on HTMLCollection? Google Chrome console.log out of sequence? 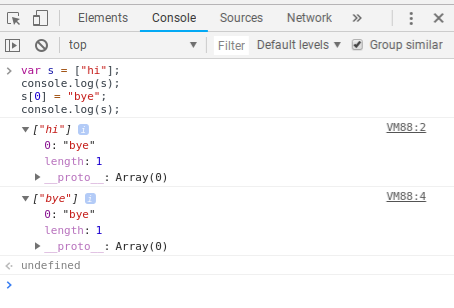 console.log(array) returns filled array, but console.log(array.length) is 0?